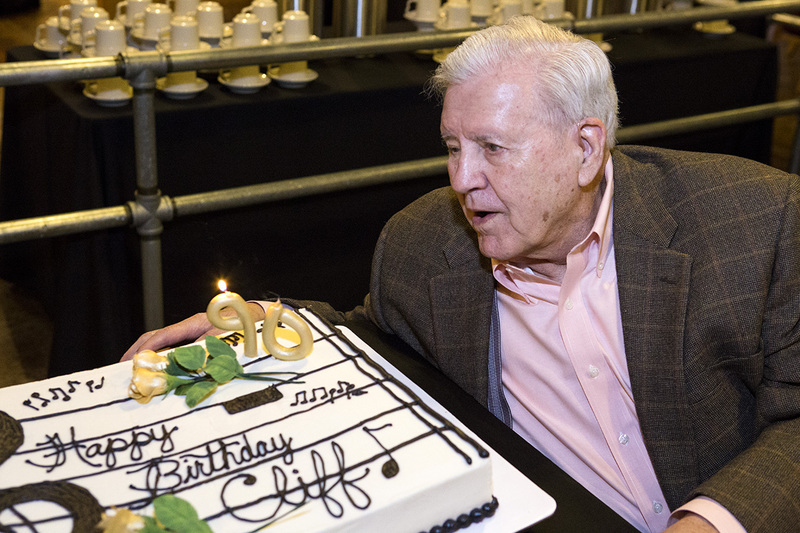 As he celebrates his 90th birthday on Saturday, Cliff Barrows is an example of a life lived wholeheartedly for Jesus Christ. Still sharp as a tack, Scripture rolls off Barrows’ tongue as he doles out wisdom gained over the course of 90 years on this planet. After 90 active years, Barrows admits his body isn’t as resilient as it once was. It’s a reality faced by countless others as they navigate the difficult process of aging. What sets Barrows apart is his joyful spirit. While many seniors allow growing old to steal their joy, Barrows will not be moved. A sense of deep gratitude permeates his spirit. He said it all goes back to believing, claiming, and continually reciting God’s promises. Barrows encourages seniors to read and think about Jesus’ promise of heaven, found in John 14:1-2. While Barrows’ words are heavily seasoned with Scripture, he also finds much joy in music. Familiar hymns are continually on the tip of his tongue. Some, he recites. Others, he can’t help but sing out loud. “There is joy in serving Jesus, every moment, every day,” he sang, before seamlessly transitioning to Scripture. Then it’s back to music, as Barrows cheerfully recites another favorite song. Psalm 42:11 is a favorite — one that keeps him from being discouraged when the going gets tough. For more from this exclusive interview with Mr. Barrows on his 90th birthday, click here. 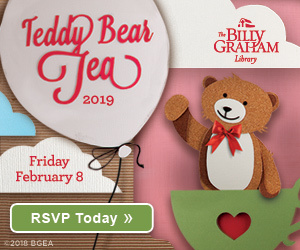 He offers his thoughts on a range of topics, including marriage, memorizing Scripture and finding delight in the Lord. 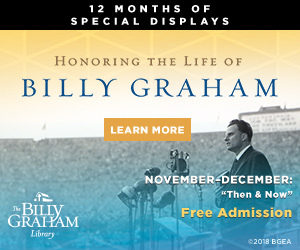 The Billy Graham Library is inviting guests to sign a birthday banner to offer Mr. Barrows personal greetings and well wishes on his birthday. 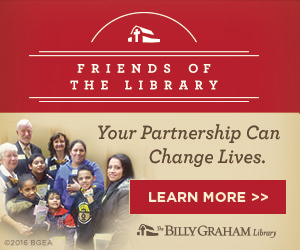 The banner will be available through April 10. Come by and contribute to this memorable birthday gift for Cliff Barrows. What a beautiful and inspiring example! I cherish this. HAPPY BIRTHDAY dear friend. I hope you day is packed full of specialness and I want you to do the things that tickle and delight your heart. Maybe sing for us would be nice!!! Blessings to you. Sending you joy along our journey home. 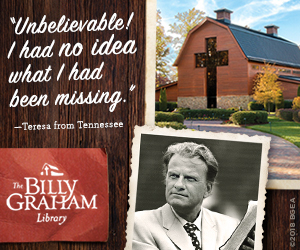 You have been so blessed by God to live a long life and have such dear friends, such as Billy Graham and Bev Shea. God Bless YOU. Happy Birthday! Thank you for living a consistent joyful life and mentoring us with music! For decades I have followed the crusades and the choir is always inspiring, I think of the thousands who have participated! God bless you my friend. Happy Birthday Mr. Barrows!!! I hope you have a lovely day!!! Parabéns! Cantei no coral da Cruzada Billy Graham nos anos 70 aqui no Brasil. You were the responsible for the choir. And you let another american pastor conduted the choir. Thank you for sharing your life lesson. I’m be blessed! Happy birthday Mr. Barrows, God bless and use you more and more. Al & I were reminesing about our time with you & Billie when we lived in Anderson, SC. I suspect the sheepskin lined coat from our store has long been outgrown. We are grateful for the shared time so long ago. Blessings as you continue serving the Lord. We are in Arkansas now wishing we could see you again. Your friendship with my dad, Jimmy Karam, was special too.